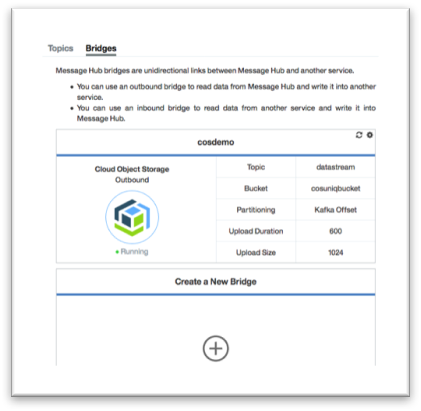 IBM Message Hub (MH) now supports a bridge which continuously uploads a topic’s messages as objects in IBM Cloud Object Storage (COS). IBM Cloud Object Storage is IBM’s latest generation, scalable cloud storage service, designed for high data durability, resiliency and security. The IBM Cloud Object Storage API is a REST-based API and supports a common set of S3 API functions for programmatic access. The storage service offers key features including server-side encryption for data at rest, flexible storage tiers, and resiliency options. 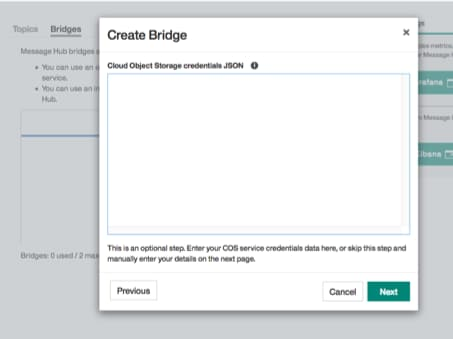 IBM also continues to offer our first generation Open Stack Swift based API Object Storage service for customers with SWIFT-based applications and this service also supports a Message Hub Bridge. NOTE: IBM recommends customers use the latest generation IBM Cloud Object Storage strategicservice to take advantage of continued feature expansion and IBM Cloud service integration. 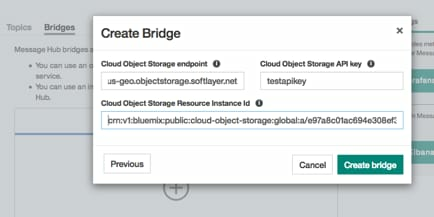 See this previously posted blog for a description of how an Object Storage bridge forms part of an end-to-end pipeline for ingesting and analyzing Message Hub data within IBM Cloud. Bridges are a standard feature of MH which allow you to easily send your event streams from MH to other IBM Cloud services for consumption. You can set up a COS bridge with a few mouse clicks as shown below, and you don’t need any programming knowledge. 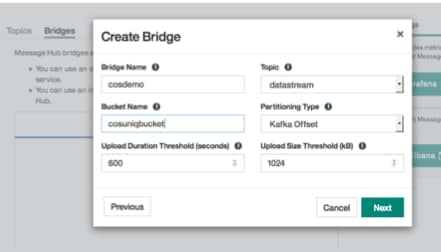 In order to create a bridge, you need to specify the bridge name, the MH topic where the messages originate, and COS bucket where the messages will be stored. The upload thresholds determine how often objects are uploaded, and the partitioning type determines the object naming convention used. For convenience, you can copy the JSON credentials from your COS account and paste them in the window below. When you’ve completed these steps, the bridge is created. The COS bucket is also created if it didn’t already exist. At this point messages will be continuously uploaded from the chosen topic to the specified COS bucket. The data can now be further transformed and analyzed using a variety of services including the IBM Data Science Experience, IBM Analytics for Apache Spark, the IBM Data Refinery, IBM Watson Machine Learning, and the IBM Analytics Engine. Get started with Message Hub and Cloud Object Storage today. Full documentation for the COS bridge is available here.